A recent rip to Monument Valley yielded an unexpected, but memorable side-trip. While researching places to camp on the trip, I came across Goosenecks State Park near Mexican Hat, Utah. It’s only twenty-five miles from Monument Valley, and it’s right next to Valley of the Gods. What better place to use as a base camp? The thing about the Goosenecks is, it’s hard to capture an image that shows the true complexity of the twists and turns the river takes as it flows through this stretch. Maybe a drone next time. Nonetheless, we set up our camp right near the edge of the gorge. As we got in the car to leave for Valley of the Gods, the wind began picking up, so, not wanting to come back to find our tent had blown into the chasm, we collapsed it and weighted it down with rocks. I took less than thirty minutes to reach Valley of the Gods from our campsite. As we entered the valley, we were nervously eyeing the heavy rain that was moving across the southern horizon. The sky was black and the features of the landscape were obliterated by the walls of falling rain. The dirt road that runs through the Valley of the Gods is seventeen miles long and the last thing we wanted was to get stuck in the middle of it in a downpour. The soil has a high clay content which means that, when wet, the roads quickly become impassable. But, as we drove into that beautiful landscape, our worries about the weather vanished and were replaced by awe inspiring views. As it turned out, we made the drive without incident, and when we returned to camp, the sky had cleared enough to give us a nice view of the waxing crescent moon. The next morning, I was up before dawn, we made breakfast, struck camp, and were on the road soon after. The destination for the day: Muley Point via the Moki Dugway. 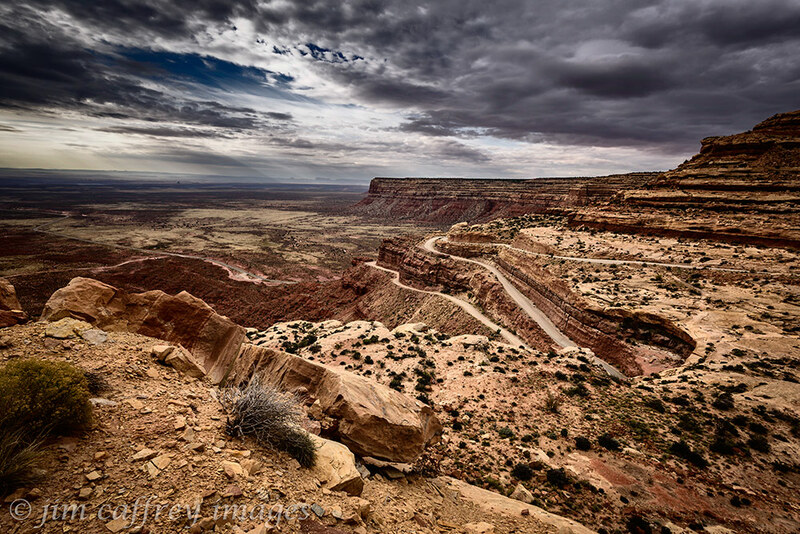 The Moki Dugway is a gravel road that climbs twelve hundred feet in a little under three miles. The Moki Dugway is a road carved into the side of Cedar Mesa. It was made in the 1950s by a mining company as a way to transport uranium ore from the mine to the mill near Mexican Hat. It climbs over twelve hundred feet in a little under three miles by a series of switchbacks. As we drove the road, we saw a rusted hulk lying on a bench about a hundred feet below, someone missed a turn. About half way up the route, there is a turn out and we stopped to make some photos before continuing on to the top. From Muley Point, you can see across the Goosenecks clear to Monument Valley. The first thing you notice when you reach Muley Point is the expansive view; looking south the incredible complexity of the Goosenecks of the San Juan River is front and center, and the sandstone monoliths of Monument Valley are visible on the far horizon. We began to explore the terrain along the edge of Cedar Mesa and were rewarded with some breathtaking vistas. I made lots of images, it seemed that around every turn there was something worth capturing. I was on a natural high the whole time we spent at Muley Point, and looking at these images on my monitor at home still gives me that feeling: grounded, yet chaotic, like the landscape. The next time I go I plan to camp right there so I can explore in a more leisurely fashion. Each of these images was made from a different perspective, and although they are essentially of the same place, they each tell a different story about how it all fits in the broader landscape. There is no shortage of great foreground elements at Muley Point, but beyond that the serpentine canyons cut by the San Juan River and the tributary ravines like Johns Canyon put on a show that changes constantly with the light. I was reluctant to leave Muley Point, but I promised myself that I would return soon. So, we packed up and drove back down the Moki Dugway and past Valley of the Gods, southbound toward our ultimate destination: Monument Valley. 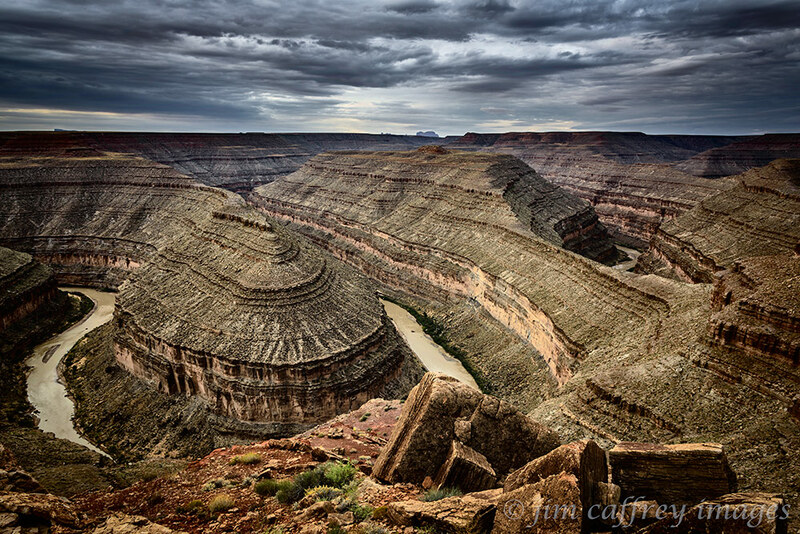 This entry was posted on November 18, 2015 by Jim Caffrey Images. It was filed under Journal, Landscapes, Locations, Nature . That’s a fantastic corner of our world. I drove down the Moki Dugway once with a 15 passenger van and a trailer, that was fun. It is an amazing place. I want to go back during the winter. Breath-taking images. Thanks for sharing Jim. Amazing pictures Jim of an amazing landscape! Stunning vistas, and such unusual formations. Really enjoyed your awesome photos, Jim, thanks for taking us along. Your images are so amazing. Love the text too! Again, such an intriguing scenery. Very different than up here north:) Wonderful captures! Thanks again, and thanks for stopping by.